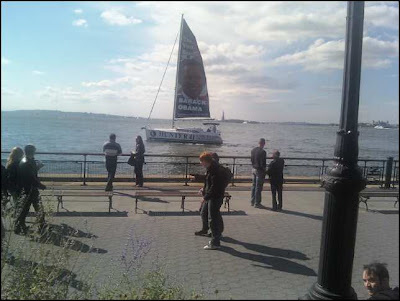 During my pathetic attempt to put in a long run before running the NYC marathon in 14 days and 11 hours, the image of McCain's face on a sailboat lurking along Battery Park forced me to stop. I couldn't believe my eyes. How could anyone get away with this? I decided to take a photo of it on my cell, but by the time I had my phone ready to snap a shot, the sailboat did a 180 degree turn and Obama's face appeared! In only a matter of moments a crowd burst with cameras in hand snapping photos left and right...now that's more like it! Make sure to check out Politico's Swing State Map featuring the most recent polling average in the most competitive states. Im almost certain that is the bench i fell asleep on!